Instead of paying sartorial tribute to the late musician Prince, Donatella Versace took things one step further by debuting unheard Prince tracks at the Versace menswear show at Milan Fashion Week. On Saturday, June 17, the Versace menswear spring/summer 2017 presentation broke away from runway tradition not only to present the latest menswear line from the esteemed Italian fashion house, but to debut the latest fashion film from the brand in collaboration with American fashion photographer Bruce Weber. The music, which was reportedly recorded in 1995 and unheard by the public until now, was played alongside other iconic Prince tracks, such as "Don’t Have To Be Rich." This time around, however, that particular tune was remixed with a new "Versace" refrain. It was a fitting tribute not only to Prince, but to the special friendship that the singer and clothing designer shared. The designer herself appeared at the end of the presentation for a final bow, wearing a purple suit complimented with a heavily ruffled black shirt. It was an outfit that seemed not only fitting of Versace, but also a great and subtle tribute to the friend and musician the world lost in Apr. 2016 — often known for his love of purple. It makes perfect sense for Versace to represent Prince through her fashion, both on the runway and in her personal style. As for the collection itself, the outfits mixed it up with loose casual-wear alongside formal, incredibly detailed looks, and with a beautiful blue and purple palette recurring throughout the items. To close the show, female models — including Stella Maxwell and Vanessa Moody — took to the stage. Perhaps this was a nod towards gender inclusive runways and presentations that have been hotly debated in the fashion world as of late. 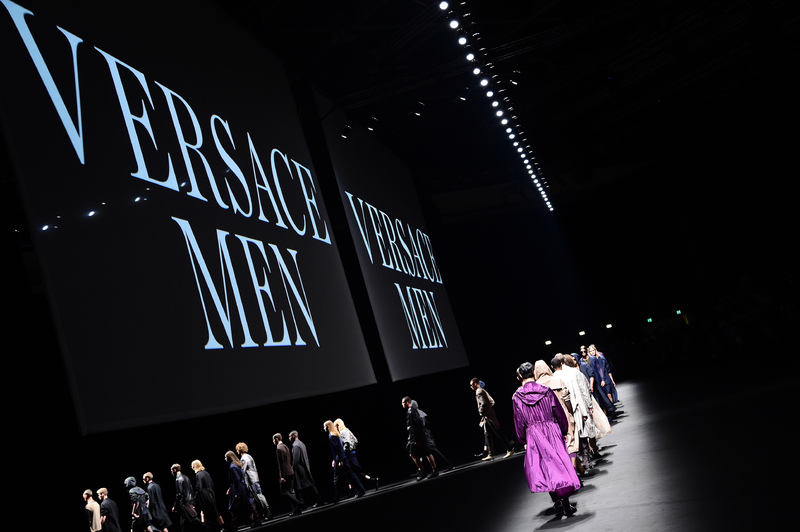 (It should be noted that Versace has said that its menswear and womenswear collections will never be shown together, according to Fashionista.) More than likely, however, featuring women on her menswear runway allowed Donatella Versace to pay further tribute to the gender play that Prince was known for. IMO, she paid as good a tribute as any to the much-loved and much-missed musician.